HARD Rock Cafe in DLF Place mall in south Delhi is air-conditioned but does not use electricity from the grid to run the system. The mall has its own captive source—generators that run on compressed natural gas (CNG). The air conditioning runs on exhaust from these generators. The exhaust gases from the three generator sets that produce 1.4 MW each benefit 160 shops, 45 offices, a hotel and a six-screen multiplex. “The generators recover the exhaust and channelize it to vapour absorption machines (VAM); these then condition the air in the mall,” said Sudhir Rawat, engineer in charge of DLF Place. The energy provided by exhaust gas equals to 1,500 tonnes of air-conditioning. “This would have required 1.8 MW capacity, but VAMs, which we imported from China, help us save that,” Rawat said. As in the case of CNG car engines, generators running on CNG use only 40 per cent of the energy produced by the fuel; the rest escapes in the form of heat. Heat is the basic requirement for air conditioning, and this can be acquired for free from hot exhaust gas and jacket water, which prevents engine parts from overheating, said Rawat. A VAM is a chamber with a coil running through it like an intestine. Hot air enters from one end of the coil, gets cooled and is released from the other end. The cooling is done by a mixture of lithium bromide and water in vacuum inside the chamber. From the generator exhaust gas and jacket water are channelled into a pipe and pushed into the VAM via an inlet. It evaporates the water in the chamber that clings to the outer surface of the coil. Lithium bromide then absorbs the heat from the vapour, cooling the air inside the coil in the same way sweat cools the body. The installation that generates electricity using CNG and then uses the exhaust gas or waste heat for cooling the mall—called combined heat and power (CHP) system—is placed in the second level basement covering 300 sq metre. Besides malls, office complexes are also using the CHP system to save energy. DLF has installed this technology in five office and mall complexes and is planning to install five more, C P Poonacha, executive director, DLF utilities, said. 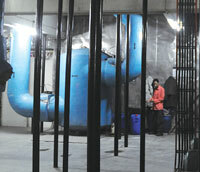 Building number 10 in Gurgaon’s IT Park has also brought down energy costs by using CHP. It has been functioning without a breakdown for three years. Any kind of waste heat recovery is green technology; it helps reduce use of fossil fuels and emissions, said S C Kaushik, head of the Centre of Energy Studies, IIT Delhi. The CHP system has been around for quite some time, but India got acquainted with it, in terms of application, only recently, he added. The first US commercial power plant using this system was Thomas Edison’s Pearl Street Station in Manhattan in 1882. According to the International Energy Agency, the share of CHP in power production is more than 50 per cent in Denmark, compared to 5 per cent in India. In Denmark it is used for heating purposes, while in India its used mainly for cooling. Poonacha said fluctuating CNG prices and high initial cost are two reasons this technology has not caught on India. That's pretty nice but the question is, Is that system safe to it's costumers? Do the air that the air conditioner blew still safe that the customer breath? 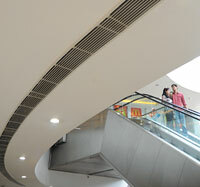 Thats very good..May be this mall is first one to run the Vapor absorption air conditioner unit using waste heat..